The Billing Office is located at the junction of Paseo del Norte and Coors Rd. Head north on Paseo del Norte to the first stop light and turn left on Irving. From Irving, turn left at the next light which is Eagle Ranch Rd., and take an immediate right into the parking lot at 9461 Eagle Ranch Rd. Please call 505-998-3089. A representative is available 8 to 5 Monday through Friday to assist you with any billing issues. Also through that number you can make a payment on your account 24 hours per day 7 days per week. We also offer interest free payment plans. 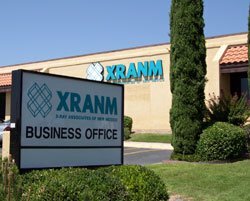 X-Ray Associates of New Mexico participates in many major health insurance plans as well as government plans. X-Ray Associates will file insurance as a courtesy to our patients. We do verify the insurance information provided by our patients prior to services rendered. This allows us to research if any prior authorizations are required for services. We also determine to the best of our ability, the out of pocket amount based upon coverage and the service provided and provide this information at the time of service to our patients. X-Ray Associates Provides Radiology services at Gerald Champion Medical Center, Cibola General Hospital and Los Alamos Medical Center. Bills from these centers will represent the physician reading studies. You will also receive billings from the hospitals. These are not duplicate billings but split bills of the Machine used for the test (Hospital) and physician fee for reading the results of the test (xraynm) and producing a report to the referring doctor. X-Ray Associates Is pleased to offer discounted fees to patients without insurance coverage.